In exchange for the pleas, the father and son will file a motion arguing it would be unconstitutional to sentence them to any type of confinement. SIOUX CITY, Iowa – A self-made titan in the egg industry, his son and the Iowa company they ran pleaded guilty Tuesday to federal food safety violations stemming from a nationwide salmonella outbreak that sickened thousands in 2010. Austin “Jack” DeCoster and his son, Peter DeCoster, pleaded guilty to misdemeanor charges of introducing adulterated food into interstate commerce. U.S. District Judge Mark Bennett will later decide their sentences, which could be up to one year in jail, fines of $100,000 apiece and additional restitution for victims. In exchange for the DeCosters’ guilty pleas, they will be allowed to file a motion arguing that it would be unconstitutional to sentence either of them to any type of confinement, according to their Washington-based attorneys. “That includes home confinement,” attorney Frank Volpe said, adding that it could likely several months before the DeCosters are sentenced. Their company, Quality Egg LLC, pleaded guilty to charges of bribing a U.S. Department of Agriculture inspector, selling misbranded food and introducing adulterated food into interstate commerce. The company has agreed to pay a $6.8 million fine – one of the largest ever related to food safety – under a plea deal that Bennett could accept or reject. The guilty pleas were entered during hearings at the federal courthouse in Sioux City. Jack DeCoster, 79, lives in Turner, Maine. Peter DeCoster, 51, lives in Clarion in northern Iowa, near the rural area where Quality Egg and its affiliates once produced millions of eggs. The salmonella outbreak prompted a recall of 550 million eggs by Quality Egg and another Iowa company that used its feed and chickens, and led to the collapse of the vast egg production empire that DeCoster built from modest beginnings in Maine. 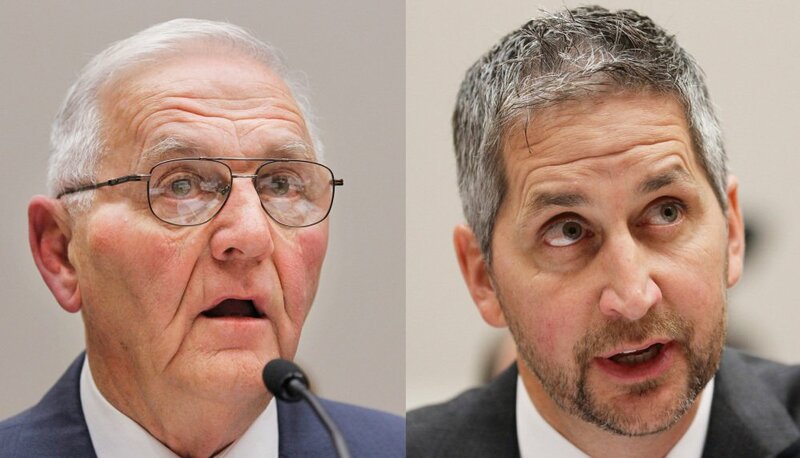 Federal investigators spent years scrutinizing its business practices in the aftermath, as the DeCosters gave up control of their egg production facilities in Iowa, Maine and Ohio and settled dozens of legal claims from those who were sickened. Plea agreements filed Monday say the company sold eggs that were tainted with salmonella from January 2010 until August, when the recalls were issued. Federal prosecutors said they found no evidence that the DeCosters were aware they were selling tainted products, but that as corporate officers, they can be held legally responsible. “They’re acknowledging that it happened on their watch,” said defense attorney Tom Green. The company admitted that former Quality Egg manager Tony Wasmund and another employee bribed a now-deceased USDA inspector on at least two occasions. Those bribes, including a $300 cash payment, were meant to influence the inspector to release pallets of eggs that had been retained for failing to meet federal standards because too many were cracked, dirty or leaking. The company also admitted that, with Wasmund’s approval, it had a longstanding practice of putting false processing and expiration dates on labels to make eggs appear fresher than they were. That practice helped the company circumvent laws in California, Arizona and elsewhere that require eggs to be sold within 30 days of their processing dates. Wasmund cooperated with prosecutors under a deal in which he pleaded guilty to a bribery conspiracy. He could get a reduced sentence in September for his cooperation. DeCoster’s egg empire expanded even as he racked up labor, food safety and immigration violations. Bennett, the judge, sentenced DeCoster to five years of probation in 2003 for knowingly hiring people who were in the U.S. illegally. Associated Press reporter Ryan J. Foley contributed to this report from Iowa City.